HAUNTED AMERICA TOURS TOP 100 BESTSELLER'S LIST! These particular books are listed in the popularity of which they have been sold through our web site. And reflect the current trends and taste in the paranormal communities current book buying and reading interest. PETER AYKROYD is a retired Government of Canada Senior Executive. He is the author of two previous books, The Anniversary Compulsion and A Sense of Place. He lives on a plot of land 20 miles north of Kingston, Ontario, that has been in the family for 180 years. ANGELA NARTH is a full-time writer of both fiction and nonfiction with seven books currently in print. She lives on the banks of the mighty Red River a few minutes south of Winnipeg, Manitoba. 6. Dark Force - The Terrifying and Tragic Story of the Bean Family By William John Bean Jr. This book is a testimony of the trauma that the Bean Family endured from the eyes of a young Bill Bean, and the story of how they finally escaped and overcame it. It is their story of trial and faith, and how that they faced things, which according to many could not possibly be real, but yet they are all too real! William John Bean Jr was born on July 29, 1966 in Baltimore, Maryland. His parents were William J. Bean Sr. and Patricia Bean. Bill has an elder sister named Patti and a younger brother named Bobby. In 1970, the family relocated to Glen Burnie, Maryland, after buying a house located on Little Road in a community called Harundale. What the family didn't know is that the house was already occupied by demonic entities. Bill Bean has stated in his own words that, "My family was literally torn apart by an evil force that co-existed among us in that house. The activity began as subtle noises and gradually escalated into violent physical attacks on us by the entities. My mother suffered the most, not only being assaulted by the entities, but also by my father as well. I witnessed a tremendous amount of blood letting in that house, as a child. He was a decent hard working man that suddenly had taken a dramatic turn for the worse. He left us in 1975, and the activity grew even more intense after his departure. This book is not for children or those who get upset easily, because this is a very terrifying, tragic and disturbing story. Mr. Burke's new book addresses the issues not only of set-up but proper evidence gathering techniques. 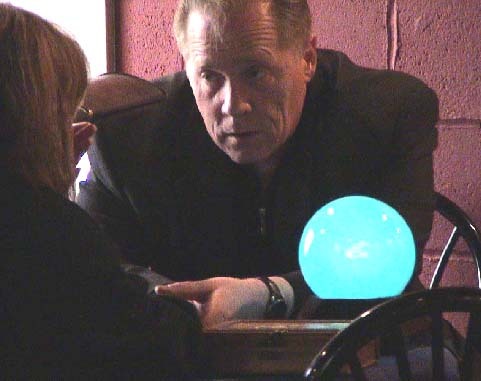 The use of psychics or intuitive people, cameras, camcorders, equipment and how to spot false positives later when you examine your film or video tape are just some of the ways Burke instructs you throughout his book. Many useful sources near the back including great web sites for other ghost hunting teams but also research web sites where additional information is there at a touch of a button. A happily married, devout Catholic, suburban mother and full-time paranormal investigator, Mary Ann Winkowski has been able to see earthbound spirits, spirits that are trapped on earth and haven't "crossed over," since she was a little girl. Mary Ann works with these spirits to help them make peace with what keeps them here - whether it be people they can't let go of or homes they love. I n WHEN GHOSTS SPEAK, Mary Ann will tell the amazing story of growing up with this gift, and will share tips on how to recognize when you're not alone, and what to do if you are in the presence of a ghost. Come explore the spooky world inside the White House! It’s one of America’s most famous and haunted homes, so keep your eyes wide open for darting shadows, ghostly apparitions, and lurking creepy creatures. We’ll hear true, scary stories from past Presidents and First Ladies, as well as from staff who work there every day and have had the chance to see it all. It’s the perfect election year book; as adults decide who will move in, kids can enjoy thinking of what the new inhabitant might encounter in the building’s many rooms and hallways. That’s a question Mark Moran and Mark Sceurman have enjoyed asking for years—and their offbeat sense of curiosity led them to create the bestselling phenomenon, Weird N.J. Now the weirdness has spread throughout the U.S.! Each fun and intriguing volume offers more than 250 illustrated pages of places where tourists usually don’t venture: it’s chock-full of oddball curiosities, ghostly places, local legends, crazy characters, cursed roads, and peculiar roadside attractions. What’s NOT shockingly odd here: that every previously published Weird book has become a bestseller in its region. What lurks out there in the fog? What was that eerie sound in the dead of night? What flitted by at the end of the street, just beyond the farthest street lamp? From earliest times, tales of the restless dead and their fellow travelers have terrified mankind. Whether around a remote campfire or in the middle of a bustling city, the unquiet spirits and attendant creatures that have tormented humanity since the prehistoric darkness haven’t gone away – they still have the power to strike fear in our hearts. Encyclopedia of the Undead traces those shadowy entities – vampires, werewolves, ghouls and monsters – that lurk just outside the range of human vision and inhabit our most frightening tales. Drawing on a wide range of beliefs and literature, it traces these horrors from their earliest recorded inceptions and charts their impact upon the human psyche. In this book, history and terror mix to create the things that lurk in the darkest corners of our minds. You’ll find detailed descriptions of terrors from all over the world – from the mist-shrouded mountains of Eastern Europe to the sweltering jungles of the Caribbean islands, from the dark, stone-lined tombs of the uncoffined dead beneath the remote New England hills to the dark magics that lurk beneath the thriving, colorful surface of a city like New Orleans. In addition to the more conventional creatures, Encyclopedia of the Undead also details some of the more obscure Things that gnaw at the edges of men’s minds – Incubi and Succubi, the Mara, and the dark legends that have influenced writers from Sheridan Le Fanu to H.P. Lovecraft. This is a book for all those who are interested in the darker side of the human mind – the side that examines and even embraces those beliefs and imaginings that form the basis of our most archetypical fears. This is the book for those brave enough to plumb the depths of our worst nightmares! Dr. Bob Curran lives and works in the North of Ireland, a place that is haunted by myth, legend and folktales. Over the years, he has studied the dark and sinister, both in his own land and in places beyond. A psychologist and a historian, he has written and lectured extensively on the arcane and the mysterious. He is the author of Vampires and Celtic Lore & Legend (both from New Page Books).